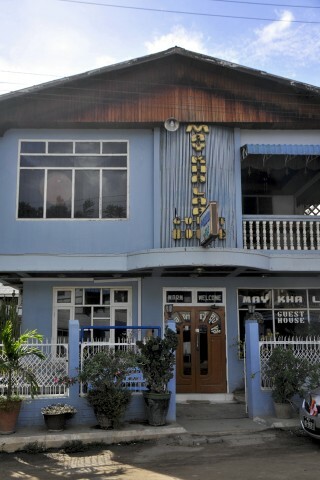 May Kha Lar Guesthouse is set in a two-storey, part-wooden building with a coat of powder blue paint. The converted family house has some reasonable deals for Bagan and is probably a good spot to meet other backpackers if you’re travelling on your own. Cheaper rooms come with shared bathroom, while some larger ones have supposedly hot showers. Upstairs rooms are better, with wooden parquet floors, while lower ones are dingier with no views, though neither would win any awards for decor. Rooms are characterless but clean enough and the doubles are large. Even the cheap ones come with an included breakfast in their small but cute communal balcony area on the first floor. The usual travel information and ticket sales are offered at reception by the helpful staff. There are no high season supplements, which makes May Kha Lar a good high season option, but we would suggest going for the larger upstairs rooms, which are worth the few extra bucks. This is a popular spot, so it’s worth booking in advance. You’ll find it placed towards the northern end of Nyaung U’s Main Road so about 10 minutes from Restaurant Row and five or so from the market.